This was something I threw together last night. I started with the chops which I’d bought at the butchers earlier, then looked in the fridge to see what I could team them with for a one-pot roast. As is often the case with this type of ‘throw it together’ cooking, you can come up with a real gem of a dish without any effort at all. The butternut squash was really good with the pork – definitely a combination I recommend – and Rob loved the melted cheese over everything. Quantities really aren’t important here; use however much potatoes, squash and pork chops you want. 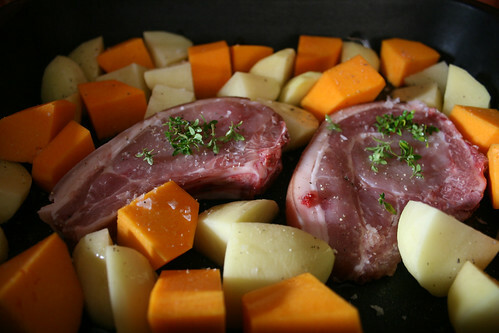 Simply peel some potatoes and butternut squash, cut them into similar sizes chunks then put them into a baking tray with some pork chops. Sprinkle over a little fresh thyme, olive oil, sea salt and pepper. 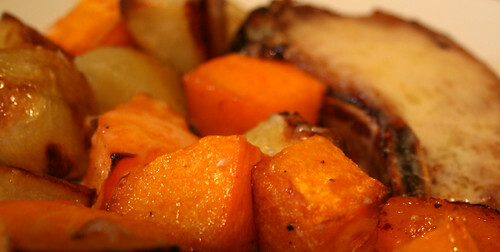 Roast at 200c for about 40-45 minutes, turning the chops and vegetables half way through. Once everything is cooked through, sprinkle some mature cheddar cheese over the pork and vegetables and pop the tray back in the oven for a few minutes until the cheese melts.